D.J. 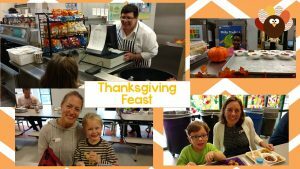 Montague had a wonderful Thanksgiving Feast at school today. 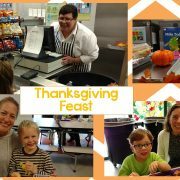 Thank you to our fabulous cafeteria staff who cooked a delicious meal for students and over 150 family members. Thank you to our amazing 5th grade team for providing adorable turkey center pieces and students to help serve the meal. What a wonderful way to usher in the holiday season. We are all thankful to be a part of the Mustang Family. Congratulations to Neil Durbin and Olivia Lappas, our first Raffle Ticket Winners! 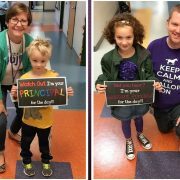 Olivia will serve as Assistant Principal and Neil as our Principal for the Day. Thank you so much to everyone who supported our wonderful PTA with this first raffle. It was a huge success. We look forward to the next raffle in the new year. Thank you- we couldn’t do it without you. 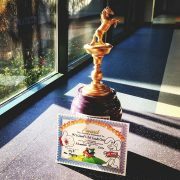 Congratulations to Mrs. Wood’s 1st Grade Class for winning the first Box Tops Competition. 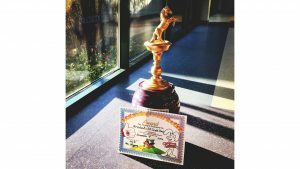 This trophy and a special treat was delivered to Mrs. Wood’s Class on Friday. Thank you to everyone who turned in Box Tops during the month of October. All money raised goes to DJ Montague. Keep collecting those Box Tops and listen for details about the next competition! There is a chill in the air one day and the next day is beach weather, the leaves on the trees are beginning to change colors and the first marking period ends next week! Fall is here! A special thank you to our PTA for organizing our fall activities and all parents and guests who attended our Halloween Parade and our Trick or Treat Family Fun Night. It is always so nice to see such a good turnout at our family events. I know the unpredictable weather this time of year makes choosing outfits for school a challenge. It is important that the students be able to go to recess for some physical activity and fresh air. Please be sure that your child dresses appropriately for the weather and has a coat or jacket so he/she can enjoy the outside time without being cold. You will be receiving, if you haven’t already done so, information from your child’s teacher regarding parent conferences. I hope that you will be able to take time from your busy schedules to meet with your child’s teacher to discuss his/her academic progress and performance at school. Your input and involvement are key to your child’s success, and we value your partnership. Please let me know if there is anything I can do to facilitate this, including transportation to school. You will receive your child’s report card at the conference. If you are unable to meet with your child’s teacher, his/her report card will be sent home on Monday, November 21, 2016. Talking to your child about his or her progress at school can be filled with emotions: joy, excitement, pride, frustration and disappointment, to name a few. Last year I included these tips to help guide your conversations and thought they were worthy of being included this year. Try to talk to your child about school throughout the quarter, rather than waiting until you receive the report card. Look at this time as an opportunity to reflect and set goals. 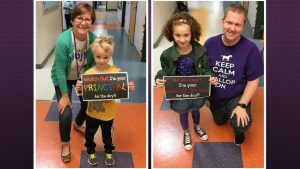 Focus on the positive aspects of the report card – a favorable comment, perfect attendance, academic accomplishment, etc. This shows you care about the accomplishments and not just the areas needing improvement. Avoid overreacting to poor grades. Be careful not to let your emotions trigger a negative response from your child. Start the discussion by asking questions like, “What do you think about this grade? Do you understand why you got this grade? Is there some specific area that’s causing you to struggle?” Answers to these questions will help you know what to include in your plan. With your child, set goals and create a plan. It is important that he/she is part of this process. Things to consider are establishing a routine for reading and reviewing notes and flash cards, a process for keeping track of dates for tests or projects, a plan for studying for tests, and asking for help when something is not understood. Emphasize to your child that you expect him/her to do their best and that you are there to support him/her. Now that the first marking period has ended, I would like to gather some feedback from you regarding our new homework initiative (No worksheets/written assignments). Your honest feedback is important and will be helpful as we move forward and consider modifications that might be needed to ensure that the change is achieving our intended outcomes: relieve some of the evening stress and demands on “family” time, provide more opportunities for children to play and participate in other activities and for you to be more involved in your child’s learning through relevant experiences. Within the next week, parents of students in grades 1 – 5 will receive an email with a link to the survey. Please take a few minutes to complete the anonymous survey. Thank you in advance for your response. 11th Veterans’ Day Program (9:00 – Grades 3 – 5 and 2:00 – grades K -2). Thank you to Dr. James A. Burden and Associates for coming to D.J. 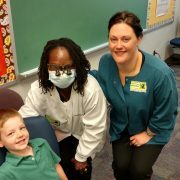 Montague today to check all of our Kindergartners’ teeth! Students also received a goody bag with a new toothbrush, toothpaste, and floss to keep those teeth sparkling. 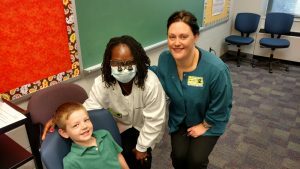 Dr. Burden’s office will be back in February to teach the students all about the importance of good dental hygiene. Thank you very much for helping to keep our students healthy!